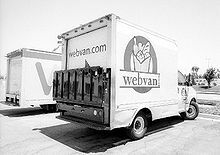 Webvan was an online grocery business that filed bankruptcy in 2001 after 3 years of operation and was later folded into Amazon.com. It was headquartered in Foster City, California, United States. It delivered products to customers' homes within a 30-minute window of their choosing. At its peak, it offered service in ten US markets: the San Francisco Bay Area; Dallas; Sacramento; San Diego; Los Angeles; Orange County, California; Chicago; Seattle; Portland, Oregon; and Atlanta, Georgia. The company had hoped to expand to 26 cities by 2001. CNET named Webvan one of the largest dot-com flops in history. Webvan was founded in the heyday of the dot-com bubble in 1996 by Louis Borders, who also co-founded the Borders bookstore in 1971. The company's investors pressured it to grow very fast to obtain first-mover advantage. This rapid growth was cited as one of the reasons for the downfall of the company. Webvan started taking orders in the San Francisco Bay Area in June 1999. Webvan placed a $1 billion order with engineering company Bechtel Corporation to build its warehouses, and bought a fleet of delivery trucks. In 2000, Webvan bought HomeGrocer, a competitor that was also losing money, for $1.2 billion in stock. At its peak in 2000, Webvan had $178.5 million in sales but it also had $525.4 million in expenses. Benchmark Capital, Sequoia Capital, and Borders each invested $3.5 million in the company in a Series A round in 1997, buying shares for 9.58 cents each. Sequoia later invested another $50 million, Softbank Capital later invested $160.3 million, and Goldman Sachs' venture arm invested $50 million. E-Trade and Yahoo! each invested $10 million. In total, venture capitalists invested more than $396 million in Webvan. The company raised an additional $375 million in an initial public offering in November 1999 that valued the company at more than $4.8 billion. Up to that time, the company had reported cumulative revenue of $395,000 and cumulative net losses of more than $50 million. None of Webvan's senior executives or major investors had any management experience in the supermarket industry, including its CEO George Shaheen, who had resigned as head of Andersen Consulting (now Accenture), a management consulting firm, to join the venture. Webvan had a contract to pay Shaheen, who gave up a $4 million per year salary at Andersen, $375,000 per year for life. When the company filed bankruptcy in July 2001, Shaheen was an unsecured creditor.. Shaheen resigned in April 2001, while the company was on the verge of shutting down. The company lost over $800 million and shut down in June 2001, filing bankruptcy and laying off 2,000 employees. As part of its shutdown process, all non-perishable food was donated to local food banks. Webvan's legacy consists of thousands of colored plastic shipping tubs, now used for household storage and its distinctly shaped vans that were repainted. ^ a b c "Webvan shuts down". CNNMoney. July 9, 2001. ^ Barry, Tim (June 16, 2013). "Amazon improves upon Webvan to create grocery business". US Finance Post. ^ "Online grocer expands". CNNMoney. November 30, 1999. ^ a b "Webvan quits Atlanta". CNN Money. April 26, 2001. ^ Goldman, David (March 2, 2015). "10 big dot.com flops". CNNMoney. ^ Lanxon, Nate (November 18, 2009). "The greatest defunct Web sites and dotcom disasters". CNET. ^ D'Onfro, Jillian (April 18, 2014). "The Founder Of A Dot-Com Disaster Is Giving His Old Grocery Delivery Idea Another Shot". Business Insider. ^ Finkelstein, Sydney; Harvey, Charles; Lawton, Thomas (2007). Breakout Strategy: Meeting the Challenge of Double-digit Growth. McGraw-Hill Education. p. 200. ISBN 0-07-145231-1. ^ a b c Relan, Peter (September 27, 2013). "Where Webvan Failed And How Home Delivery 2.0 Could Succeed". TechCrunch. ^ G. Weinzimmer, Laurence. The Wisdom of Failure: How to Learn the Tough Leadership Lessons Without Paying the Price. ^ Wolverton, Troy (October 30, 2001). "Seeking relics amid Webvan's ruins". CNET. ^ Beltran, Luisa (June 26, 2000). "Webvan goes shopping". CNNMoney. ^ FISHER, LAWRENCE M. (June 27, 2000). "Webvan Will Acquire HomeGrocer.com". The New York Times. ^ a b c Emert, Carol (July 15, 2001). "Venture lessons in Webvan collapse / Financing history a cautionary tale". San Francisco Chronicle. ^ a b RICHTEL, MATT (November 6, 1999). "Webvan Stock Price Closes 65% Above Initial Offering". The New York Times. ^ "FORM 424(B)(1), Webvan Group, Inc". U.S. Securities and Exchange Commission. November 5, 1999. ^ "Webvan pays off Shaheen". CNNMoney. May 16, 2001. ^ "Nevadans lose jobs at 'Net's Webvan". Las Vegas Sun. July 9, 2001. "The company's list of unsecured creditors will include Webvan's former CEO George Shaheen, who resigned in April, triggering a clause in his contract that required the company to pay him $31,250 per month for the rest of his life. With the bankruptcy, Shaheen "will have to get in line with the rest of our creditors," Grebey said." ^ Delgado, Ray (July 9, 2001). "Webvan goes under / Online grocer shuts down -- $830 million lost, 2,000 workers fired". San Francisco Chronicle. ^ "Webvan bags it for good". ZDNet. July 9, 2001. ^ Sandoval, Greg (September 7, 2007). "Webvan delivers its last word: Bankruptcy". CNET. ^ Cohan, Peter. "Four Lessons Amazon Learned From Webvan's Flop". Forbes. ^ Aboujaoude, Elias (2012). Virtually You: The Dangerous Powers of the E-Personality. W. W. Norton & Company. p. 54. ISBN 0393340546.